The effects of the financial crisis have finally been overcome by the US airline industry. After falling 8.7% in the economic turmoil that followed the 2008 financial markets meltdown, domestic passenger totals on are finally back above their pre-crisis levels. The number of passengers who flew US domestic routes in the 12 months ending August 2015 was 11,650 higher than the previous 12-month peak, set in February 2008. September’s total increased the record by 3.6 million passengers, according to the US Department of Transportation’s latest statistics. Passenger totals for all routes have been above the pre-crisis totals since August 2014, the result of steady growth in international air travel. 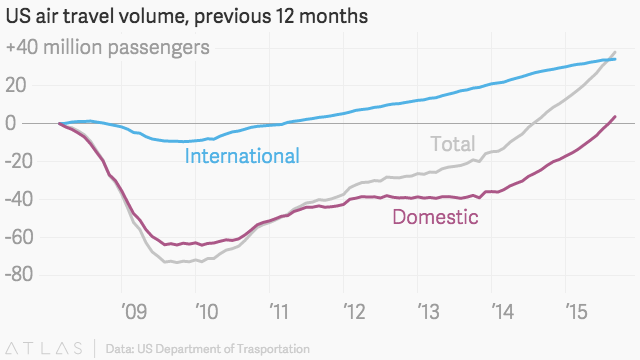 But most of those gains came from passengers flying non-US carriers. Non-US carriers flew 23 million more international passengers to the US in the 12 months ended September 2015 than they did in the 12 months ended August 2008, when the US saw its previous peak in international air travel. 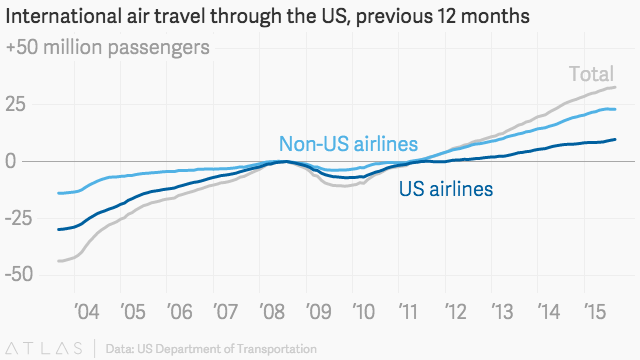 Over the same time period, US airlines flew only 9.7 million more international passengers. This is why the domestic-travel figure is so important. Even though the airlines have found solid financial footing for some time now, they had yet to bring the largest part of their business (and the part that isn’t subject to foreign competition) back to the levels they once enjoyed. 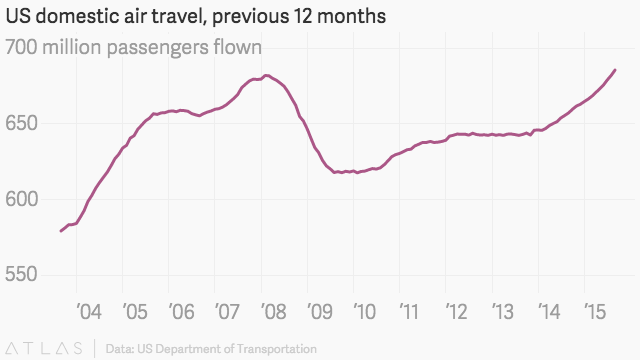 Now, it’s back, which is good news for the airlines—and an indicator of good things for US economy.